Kenyan parliament has approved a motion to leave the International Criminal Court (ICC) following an emergency debate. A bill to this effect is expected to be introduced in the next 30 days, after opposition MPs boycotted the vote. The ICC has charged President Uhuru Kenyatta and Deputy President William Ruto with crimes against humanity, which they both deny. William Ruto’s trial is due to start in The Hague next week. The ICC said the cases would continue even if Kenya pulled out. The charges against both Uhuru Kenyatta and William Ruto stem from violence that broke out after disputed elections in 2007, in which more than 1,000 people were killed and 600,000 forced from their homes. Uhuru Kenyatta is to go on trial in November. They were on opposite sides during the 2007 election but formed an alliance for elections in March this year, and analysts say the ICC prosecutions bolstered their campaign as they portrayed it as foreign interference in Kenya’s domestic affairs. Eeven though the vote does not halt the cases, it sends a powerful signal of defiance to The Hague – a sentiment that is becoming increasingly popular, in Kenya and across much of Africa. No other country has withdrawn from the ICC. Kenya’s parliament is dominated by the Jubilee coalition formed by Uhuru Kenyatta and William Ruto. The motion, tabled by majority leader Adan Duale, said the pair had been “lawfully elected” and the government should take steps to “immediately” withdraw from the Rome Statute, which established the ICC. It also says Kenya will “suspend any links, cooperation and assistance” to the ICC. Adan Duale noted that the US had refused to sign the Rome Statute to protect its citizens and soldiers from potential politically motivated prosecutions. “Let us protect our citizens. Let us defend the sovereignty of the nation of Kenya,” Adan Duale is quoted as saying. 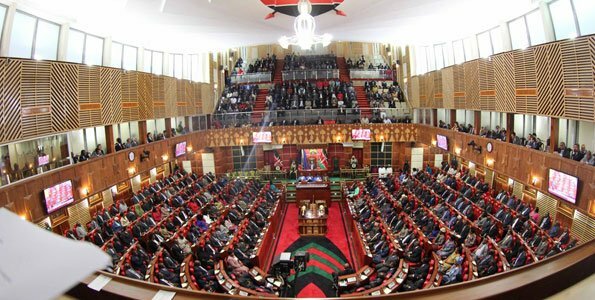 MPs from the opposition Coalition for Reforms and Democracy (CORD), led by former PM Raila Odinga, walked out of the debate, calling the motion “capricious” and “ill-considered”. Kenya’s withdrawal would not bring “honor to the nation and dignity to our leaders”, CORD said in a statement. “Kenya cannot exist outside the realm of international law,” it said. In May, the African Union accused the ICC of “hunting” Africans because of their race. The ICC strongly denies this, saying it is fighting for the rights of the African victims of atrocities. The court was set up in 2002 to deal with genocide, crimes against humanity, war crimes and the crime of aggression. The ICC has been ratified by 122 countries, including 34 in Africa. Why John Kerry looks different?